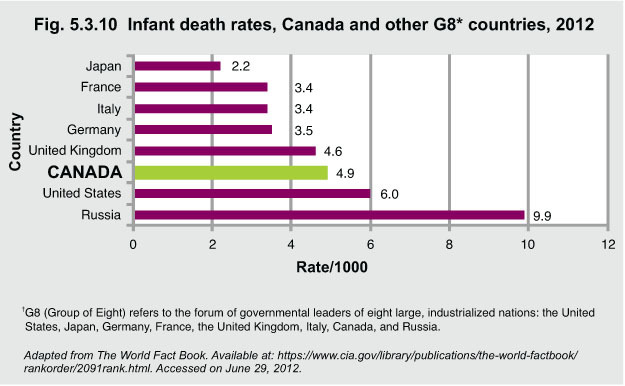 In 2012, among the G8 countries, Canada has a lower infant death rate (4.9/1,000) than the United States (6.0/1,000) and Russia (9.9/1,000) and a higher infant death rate than the United Kingdom (4.6/1,000), Germany (3.5/1,000), Italy and France (3.4/1,000), and Japan (2.2/1,000). On a worldwide basis, Canada ranks favourably. Some countries have very high infant death rates. For example, currently Afghanistan had the highest infant mortality rate, at 121.6 per 1,000 live births.